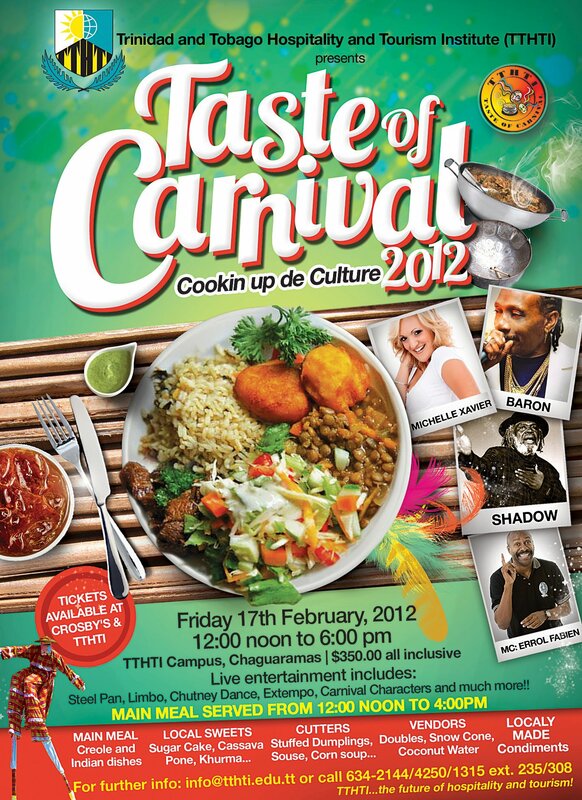 TTHTI’s annual fete, TASTE OF CARNIVAL is back on Friday, February 17th, featuring some of Trinidad & Tobago’s tastiest local foods – Creole and Indian dishes, local sweets (sugar cake, cassava pone, korma, etc. ), cutters (stuffed dumplings, souse, corn soup, etc. ), vendors (doubles, snow cones and coconut water), along with locally made condiments. The TASTE OF CARNIVAL will feature live entertainers including Baron, Shadow, Michelle Xavier and Errol Fabien as MC, as well as Steel Pan, Limbo, Chutney Dance, Extempo, Carnival Characters and much more. WHEN: 12pm – 6pm, Friday, February 17, 2012; Main Meal will be served from 12pm to 4pm. ADMISSION COST: $350 all inclusive; TASTE OF CARNIVAL tickets are available at TTHTI and Crosby’s (54 Western Main Road in St James). Check out our COMPLETE LIST OF T&T’s CULINARY EVENTS & FESTIVALS!